The West Michigan Woman Brilliance Awards honored 30 finalists and 10 winners at their second-annual event held at the Amway Grand Plaza. Hundreds attended to cheer on those who have made remarkable contributions to our community—especially with regard to women's empowerment. West Michigan Woman Magazine is a print and online publication created for and by professional women in our community. With a distinctly local focus, it offers engaging, relevant content on subjects ranging from career, to travel, to home life, to wellness—and more. 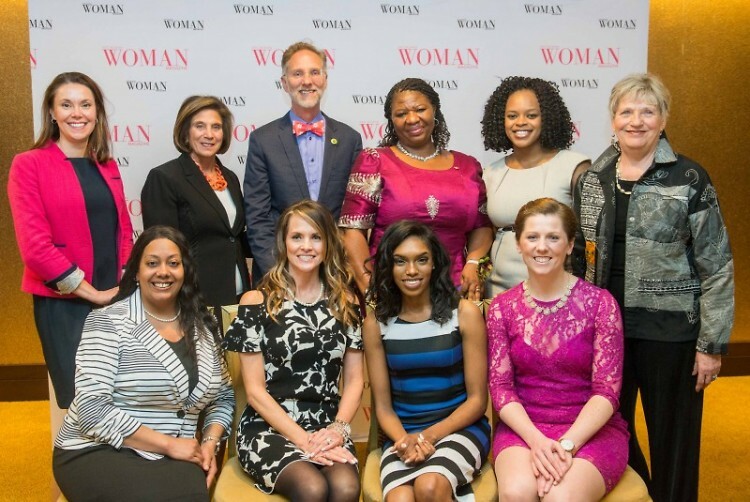 On April 26, 2018, West Michigan Woman announced the winners in each of the Awards’ 10 categories: Tenacity, Team Player, Social Change Agent, Mentor, Entrepreneur, Emerging Leader, Connector, Champion of Service, Best Supporting Man, and Woman of the Year. The award categories are based on characteristics and actions that help women elevate their careers, and the nominees represent those who excel in those areas. A diverse selection committee was created and tasked with narrowing hundreds of nominees down to just 30 finalists—three in each of the 10 categories; all impressive in their achievements. As Kasie Smith, Publisher - West Michigan Woman, said, "The 2018 finalists are truly inspirations to all professional women and men in our community and West Michigan Woman magazine is truly honored to shine a spotlight on their success." Mary Hollebeek, Ambassador and Board Member, Mel Trotter Ministries for Tenacity. Ms. Hollebeek has endured unimaginable adversity in her life, from the tragic loss of both parents, to a son’s chronic illness, to her own auto-immune disorder that left her paralyzed and in a wheelchair—not once, but twice. Through spirit and determination, she is now walking again and has used her experiences to give back to the disabled and disenfranchised in our community. Dr. Jamie Caughran, M.D., Medical Director of the Mercy Health Comprehensive Breast Center for Team Player. As a leader, Dr. Caughran has created an exceptional environment of trust, idea sharing, and innovation among her team that has resulted in greater support for the needs of breast cancer patients. She empowers her team to be independent and ask bold questions, provide groundbreaking care, and make patients the focus of all decision making. Tessa Hessmiller, J.D., Assistant United States Attorney, U.S. Department of Justice for Social Change Agent. Ms. Hessmiller, when not in the courtroom, is a community activist focused on raising awareness of and helping to prevent human trafficking, particularly sexual trafficking. She conducts seminars that help identify what human trafficking is and what signs to look for and report, ultimately with the goal of ensuring a safer community for all children. Tanell Hills, Co-Founder/Assistant Executive Director, Endless Opportunities for Mentor. Drawing from her own needs as a youth, Ms. Hills created Endless Opportunities to provide youth-centered services, including networking, résumé building, and interview skills development. She also launched the I.M.P.A.C.T. Mentoring Program, and has logged more than 1,000 hours mentoring and empowering young women in the area of professional development. Karen Scarpino, President and Owner, Green Giftz for Entrepreneur. Ms. Scarpino has changed public perception of branded merchandise through the creation of eco-friendly and sustainable products, many of which re-use sourced and scrap materials. Her philosophy, "If you have an idea, run with it," has helped her develop high-design branded items with lower environmental impact. Recently, Green Giftz moved its commercial space to downtown Grand Rapids. Denavvia Mojet, Strategic Communications Coordinator, LINC Up for Emerging Leader. Ms. Mojet has inspired the next generation of leaders through her work on several political campaigns and for the Grand Rapids’ Downtown Development Authority. In addition to serving on the board for both Well House GR and Equity PAC, she hosts the radio show “Political Pulse with Denavvia Mojet” on 97.3 The Beat. Most recently, Ms. Mojet joined LINC Up with a goal to help uplift marginalized members of our community. Judy Welch, Executive Director, Michigan Women's Foundation-West Michigan for Connector. Ms. Welch has been a natural connector from an early age, and has used her strong abilities over the years to advance two women’s organizations in the West Michigan community: Inforum, which helps connect and advance women in the workplace, and Michigan Women's Foundation, which aims to bring economic and social equality to women and girls. Latoya Person, Managing Partner, Management Business Solutions for Champion of Service. Tirelessly serving the community, Ms. Person is a volunteer on the board of BLEND (Business Leaders Linked to Encourage New Directions) and co-founder of One in Christ Ministries. She also offers her time, mentorship, and necessary goods to vulnerable individuals and families as a volunteer for Hope Community, Liz’s House, Adams Park Apartments & Shelters, and Degage Ministries. Carl Erickson, CEO and Co-Founder, Atomic Object for Best Supporting Man. Mr. Erickson has worked to increase diversity and create more equality for women in the software industry. He created the non-profit SoftwareGR, with a mission to build and support our local software development community, and BitCamp, which is a one-day program designed especially for junior high school girls, to introduce them to software development, IT, and tech programs. The evening concluded with a standing ovation and powerful and inspiring speech by Woman of the Year, Dr. Nkechy Ekere Ezeh. Nominations for 2019 will open in November of 2018. [MIDTOWN] Upcoming winter events for Midtown neighbors!